As a professional voice actress, I’m often tasked with creating accents ranging from foreign accents and regional dialects to fun and crazy characters. Just this past week, I had requests from clients for a variety of voice over accents including European accents, a Texas accent, an Asian accent, and a voice like the computer in 2001 A Space Odyssey. Some of my voice over clients have even told me that research has shown that the buying public will give greater credence to a speaker who has a British accent, than one with an American accent. And even more so, if it’s a female voice actress with a British accent. And that’s good for me, because speaking with a British accent is something I can do well. Coming from the stage world, I’ve practiced my fair share of accents. I also grew up with a best friend whose mother was from England. As a child, I had an ear for listening to her very closely and picking up her accent. So when I got the chance to play roles in plays by classical British playwrights like Oscar Wilde, Noel Coward, and even William Shakespeare, I already had the British sound in my mind. Working with coaches throughout the years, and just on my own with audio tutorials and even YouTube, it has been fairly easy for me to hear and replicate sounds that give a credible representation of someone who speaks English but is from a foreign country. It’s funny how we tend to stereotype regional dialects; Valley girl, surfer dude, Da Bears guys, NY cabbie, etc. 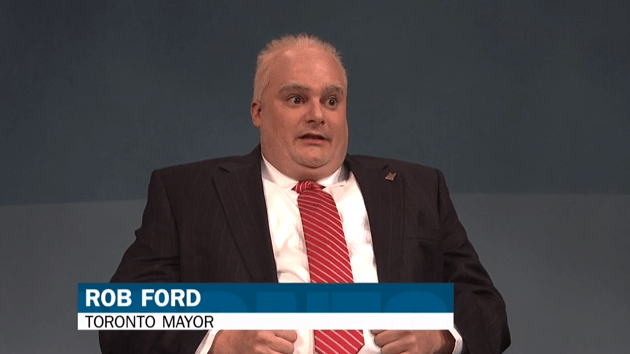 I even thought that the Canadian accent was lampooned in Bobby Moynahan’s version of Toronto mayor Rob Ford on SNL recently. 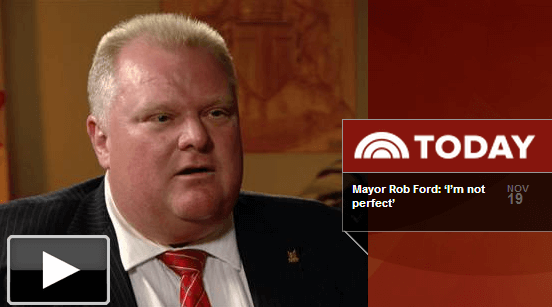 UNTIL I saw an interview the following Monday on the Today show with Matt Lauer and the real mayor. After that, I thought Moynahan’s interpretation was pretty accurate. So, when does the line from an exaggerated character blur to a true representation of a real person? We hear the phrase, “Truth is stranger than fiction” and I often think that to be relevant in creating characters as well. Even when, as actors, we go to what we think are the outer reaches of a characterization through voice, we can still find REAL people, who reach beyond the boundaries, and seem to be a caricature of themselves. What about the guys from Duck Dynasty, or the family in Honey Boo Boo, any of the “real” housewives, or everybody’s favorite celebrity family, the Kardashians? Reality TV seems to have shown us that real folks can be far more interesting to the mainstream audience than some character made up by a playwright or TV sitcom writer. And certainly terrific fodder for late night hosts, and SNL to parody. All in fun, right? I find creating voice over accents for characters to be one of the most enjoyable tasks I have as a voice over professional. I’ve done my share of silly voices and playful characters, and right now, I’m even playing a Southern Belle, SuperHero Duck on an animated series, targeted at financial literacy for children, called “The Centsables”. And one of the most fun things about playing with characterizations for voice work, is transferring that enjoyment to my 12 year old daughter, who has also been working as a professional voice actress for the past few years. We’ve actually created characters on the Centsables together, playing mother and daughter in a recent episode, in addition to her turn as a “villain” on an earlier episode this season. Passing on the tradition of play, through voice acting is a real gift to me. I am truly a lucky lady. Published by Debbie Grattan on 11/27/13. Debbie Grattan is a Voice Actress who has been in the business for 20+ years, racking up well over 10,000 completed voice over services projects while partnering with hundreds of production companies, marketing and advertising firms, commercial voice-over recording studios and corporate/business clients around the United States and abroad. Check out Debbie’s Voice Actress Demos and request a voice over services quote for an upcoming project. Thanks for your comment. All of the most recent articles do have at least one picture or and/or video included in the post. So, I agree with your statement and have been moving in that direction for awhile now. The actual article you posted your comment on had both a picture and a video. I’m wondering if you were able to see them when you viewed the article?